When Vincent Fletcher and Nic Comrie went to market for a warehouse management system for their logistics business, they couldn’t find a suitable solution ­– so they made their own. Xero, a New Zealand-based software company, has revolutionised the accounting sector with its cloud-based accounting software solution for small and medium-sized businesses. Established in 2006 by Rod Drury after recognising that traditional desktop accounting software had become outdated, Xero is now one of the top 20 companies on the New Zealand Stock Exchange and is listed on the Australian Securities Exchange. Xero uses the Software as a Service (SaaS) model and is sold by subscription, based on the type and number of company entities managed by the subscriber – this makes the solution more accessible for small- to medium-sized businesses. The business now has offices in New Zealand, Australia, the US and the UK and services customers in more than 180 countries. Influenced by the success of and philosophy of Xero, Queensland-based Vincent Fletcher and Nic Comrie saw a similar gap in the market for small to medium-sized businesses operating in the logistics sector for warehouse and transport management systems. 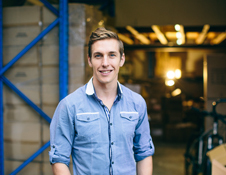 In July 2012, Vincent and Nic took over a cold-storage logistics company. In the first few weeks of taking over, they realised that the business was not as healthy as they first thought. “There were a lot of inefficiencies, we couldn’t believe how manual everything was,” Vincent says. What surprised him was the cost of delays in invoicing, paper proof of deliveries being lost, high administration and operation costs, along with the manual processing of everything. “We thought there had to be a better way, so we started to look for software to speed and smarten things up, but after looking around we couldn’t find anything that was cloud-based or small-business orientated,” he says. What Vincent found is that most transport and/or warehouse management systems are geared towards a larger logistics businesses. Many of these enterprise systems, apart from being expensive up-front, are based on old, desktop-style computing and had no mobile applications or ease of automation, he says. “One of our key drivers in all of this was to be able to automate manifests from 50 different clients. We were a small company and couldn’t force them to provide the data in a set format. When we began looking at what software could handle this kind of problem, we quickly realised nothing existed, and we would have to build our own software,” Vincent says. With Vincent’s expertise in software development and Nic’s in logistics, the two of them set out to develop the kind of software they knew they needed. “We constructed what became CartonCloud for our own business and it completely turned the business around,” Vincent says. After nine months of running the software in their own logistics business, Vincent and Nic managed to reduce their administration staff down from three full time staff members to one part-time staff member. They also managed to cut their warehouse staff by two thirds, even though they were picking and packing more orders than before. “We found that a lot of our warehouse staff time was being spent dealing with customer queries. A client may call up and want to place an order for some of their stock. The staff would then have to manually check the floor, or look at a spreadsheet in order to provide an indication of how much stock they had left. What usually followed was a question about where the rest of the stock had gone and so on. It could take ten minutes to check on a client’s order ­– that’s crazy,” Vincent says. Once they were able to implement a system that would automate this process and provide real time information for both the 3PL and the client, the phone stopped ringing. “We just thought all this was so time-consuming, why not automate it and have a system that they client can look into themselves to get answers in real time. Once we realised this, we turned the whole business around,” he says. Even cases of a client calling up to find out if deliveries had been made were eliminated as they could log in themselves and see. At the end of 2014, Vincent and Nic were starting to get enquiries from other refrigeration companies, who shared the same pains and frustrations, which caused them to look at how they could sell the software to other businesses. “By the middle of 2015 we had sold the logistics business and we concentrated on selling this software full time,” Vincent says. Today, over six million jobs have been processed through CartonCloud, servicing businesses in Australia, New Zealand, Vietnam, Singapore, Fiji and Samoa. For Vincent, a big differentiator of the CartonCloud offering was that it was designed to work with mobile phones and that it can be used by the clients of the 3PL. “Usually with this kind of software, what the 3PL’s client can see or do is very limited. However we knew that having this feature would be what would save the time and money for businesses like ours,” Vincent says. Making customers self-serving, cutting out the need to call and make individual queries saves in administration staff and time that could be spent working on the core function of the business. By creating a cloud-based solution, smaller logistics companies can have access to the solution. This was an idea that came from Xero. “They were one of the first companies that made people realise that cloud software could be so powerful. Xero came and flipped the whole industry around. We knew we had to similarly make our system cloud-based,” Vincent says. Clients are charged a per week fee based on the number of warehouse orders and transport jobs they do. “Some of our larger clients have about 100 trucks but some have three or four, and in warehousing we have some clients who do five orders a week and others who do close to 10,000,” he says. According to Vincent, many smaller size logistics businesses are not serviced well by the current offerings available in transport and warehouse management systems. “A lot of businesses we work with have either never implemented a system, or moved to one in the past but they may have found it too restrictive or too hard to use,” Vincent says. In some cases, clients have spent over $80 thousand on an enterprise platform to then find that they just can’t figure out how to use it. Vincent says this is largely to do with the fact that they are not “experienced system administrators”. A common issue, for example, is when someone miss-picks an order, they have to jump through hoops in order to correct it. But with the inspiration of Xero, CartonCloud has made a system whereby users have the ability to roll-back orders and make corrections easily. “Traditionally with these systems you would be locked in with the point of no return, but CartonCloud allows you go back, recording the history as you go so that everyone can see this has occurred rather than making a solution that only lets you go forward,” Vincent says. For more info, visit https://www.cartoncloud.com/.